Some photos of the super-simple cordura pouches Dad made for his archery equipment. These little pouches -they're about 9" long - are the free gifts his clients get when they order a custom-made bow case from him. Completely lined and padded, they unzip flat. The zipper is one continuous piece of zipper tape, not two halves. Here's a shot of the end of the zipper, which is actually the middle of the zipper tape. Couldn't be bothered to do a photographic step-by-step, since I'm on vacation after all, but here are some text instructions instead. Cut the length of zipper tape you need (perimeter of the pouch plus about 2" allowance). We like zipper tape by the foot - the sort for which you have to buy separate zipper pulls that fit it. 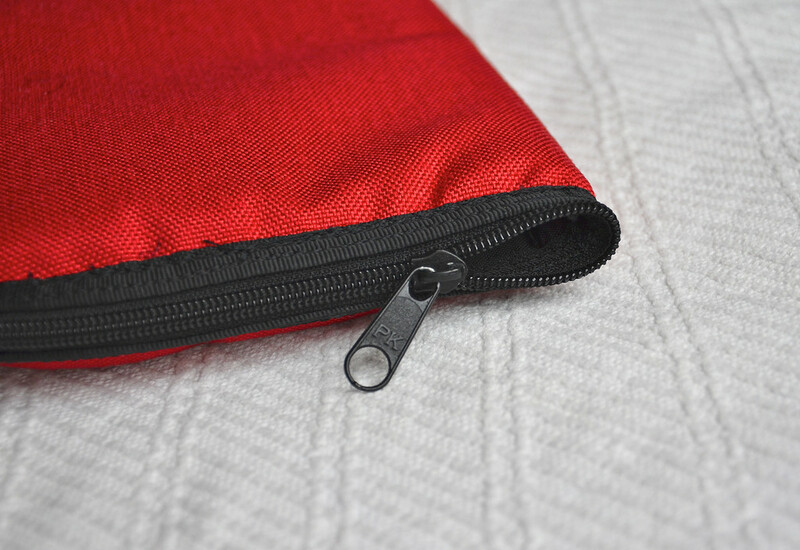 If you are using an actual, complete zipper, remove and discard the zipper stop at the end, and slide the zipper pull out. Separate the zipper tape into two halves and put away one of the halves. Leaving about 1" end allowance, sew the zipper to the edge of the thing (the pouch, in this case) to which you want to attach it. Sew all the way around till you reach the point where you started, leaving the other 1" end allowance. Close the pouch so the two 1" ends meet, slip the zipper pull back over the two ends, and zip the pouch up. And that's how Dad does his zippers. You've probably seen them on things like those continuous-zipper bags and zip-up-able coin pouches, right? I have too, but I never thought to make regular pouches the same way, a classic "why didn't I think of that?" example of how I've just done things one sad way all my life when there were other, better ways to do them. Sort of like the smoooooooth waistbands on pants and skirts that have revolutionized the way I sew children's bottom garments. Duh. Not related: Dad and I are thinking seriously of finally getting our industrial sewing machines. So we can sew more, of course, but also so we can sew more of the stuff that is tricky on home sewing machines, because of the size of the projects that makes them unwieldy, and the layers of nylon and packcloth and padding. Now it's a sort of race to see which of us will buy one first. I suspect Dad will, since he's actually selling stuff that requires one, whereas I'm just producing stuffed animals and wimpy totes and toys and random amateurish children's clothes and maybe the occasional neoprene thing. Must start doing my research. Anyone got an industrial machine to recommend? I need mine to do a good straight stitch, is all. I have a Juki DDL 227 which I have bought 2nd hand about 30 yrs ago. I sew EVERYTHING on this machine! and it is still going strong. 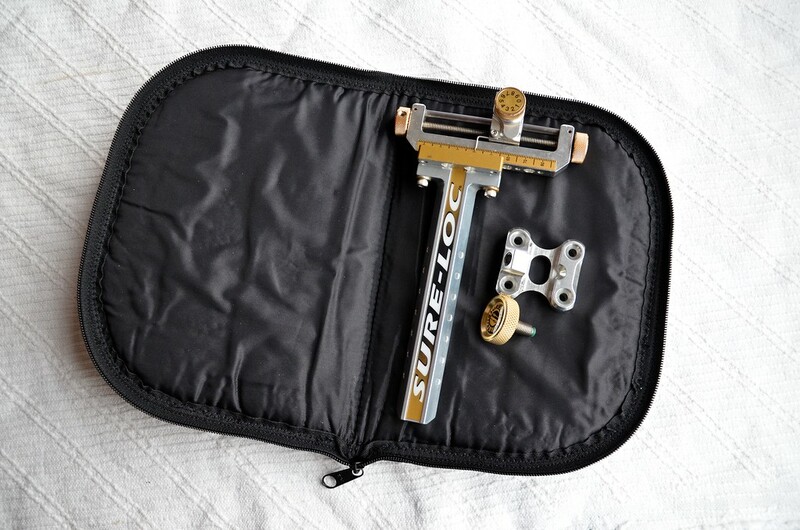 A good straight stitch machine which can handle anything from silk to heavy canvas and leather ( using a teflon foot for leather). Check Craigslist. I see them pretty frequently, though it certainly isn't like selecting the precise one you've always wanted. Hi. My friend bought one off of ebay last year and it is amazing. I am not sure of the brand but it sews canvas and other tent fabrics like it is cotton. I LOVE it. BUT...be careful as it only came with a positive and negative wire, no earth and it is a full metal machine - he kept getting shocks from it and so he had to earth it - as an electrician that was easy for him, not so easy for the rest of us. SO when you are getting one, check to make sure it is safe, but definitely get one, they are BRILLIANT, AWESOME, AMAZING, WONDERFUL etc!!! Not that I have one, but friends who are crazy talented seamstresses have Juki machines. Oh, I understand everything up until #4... did you take a shot of what the finished pouch looks like after you rethread on the zipper pull? 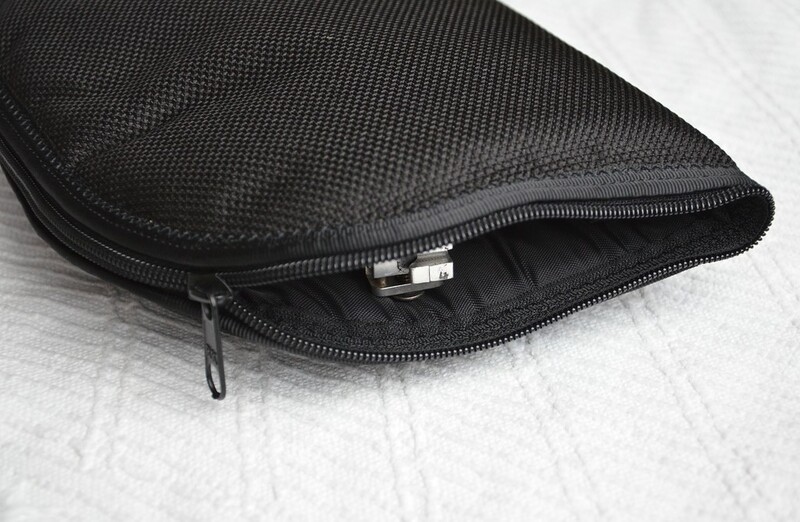 It would be the opposite corner to where you show it's a continuous zipper when the pouch is zipped closed. I can't figure out how you finish the ends of the zipper onto the pouch when it's zipped together into a corner so the zip pull doesn't unzip all the way when you open the pouch. or you could leave the ends sticking out and sew a tab to enclose the ends externally. 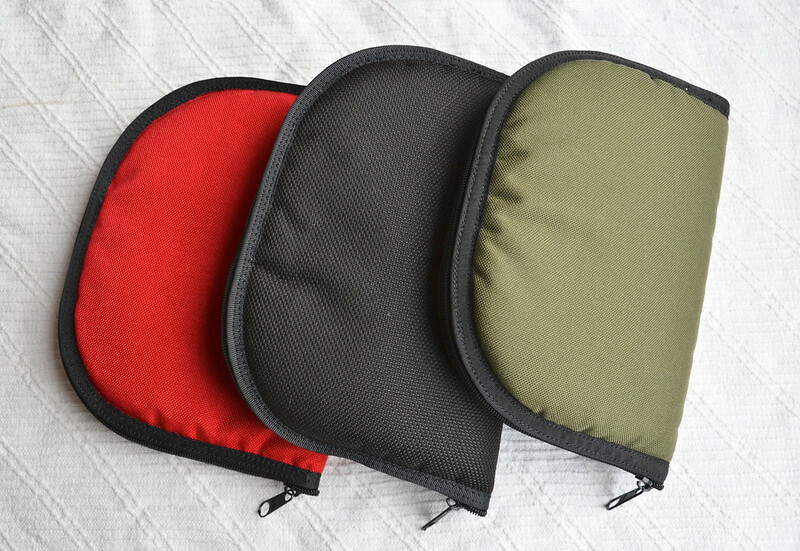 Many people do this when they make the typical zippered pouch for toiletries. The advantage of using this half-a-zipper tape method is that you'd only have to deal with the ends of the zipper tape on one corner of the pouch, not both, since one of the corners is now the smooth middle portion of the tape. hope you are enjoying your vacation. I card boarded with the kids yesterday and thought of you. I would have never started making cardboard things if it weren't for your inspiration. My kids really thank you! Yes, GG, it does. So you're not saving zippers. As I said in the previous post, one zipper makes two pouches. What you do save is finishing one end of the zipper tape (see reply to YC above) and an overall neater product. 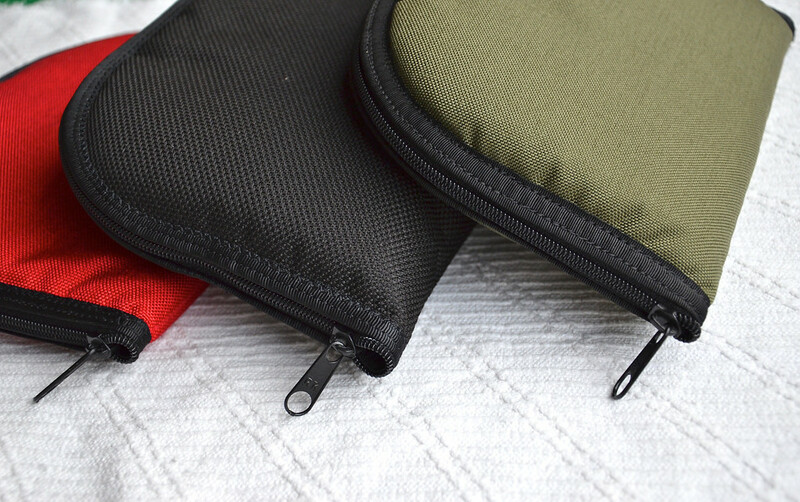 The other obvious advantage, especially if you've installed zippers around edges of pouches like these, is that you don't need to line up the two sides of the zipper tape to make sure they meet without skewing when they're zipped up. With this one-sided zipper, you'd still have to do some aligning, but it's a matter of millimeters, and it's done after the sewing. 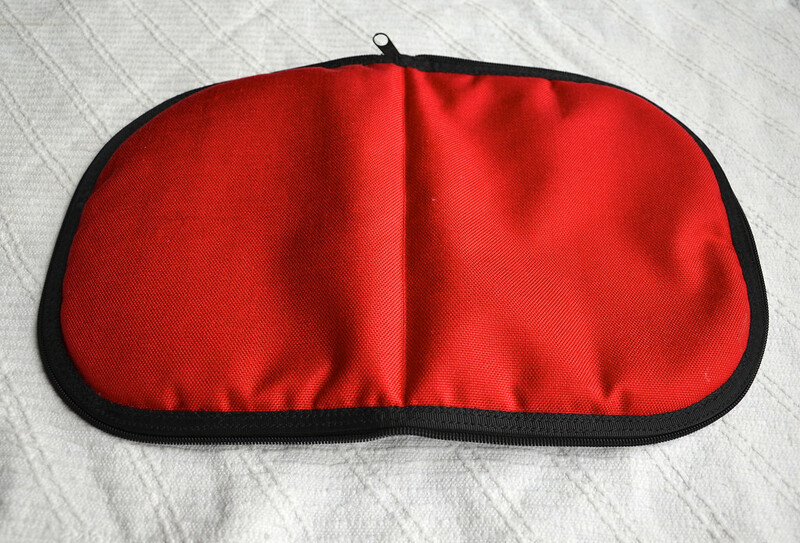 You just sew the zipper tape onto the pouch, and thread in the zipper pull and zip it up- if it is slightly misaligned, remove the pull and try again. You needn't baste or unpick the stitches like you would if you installed the zipper the usual way. It seems there was a (beneficial) zipper mutation in the genes, which you've apparently inherited.